Halo semua..!! Nice to see you again in other home recipe. Have you try other recipe that we already published before? How is it? I hope it’s taste delicious. If you have any trouble, or have any request of some recipe, do not hesitate to write to us. We will try to help you and reply to your request as soon as possible. 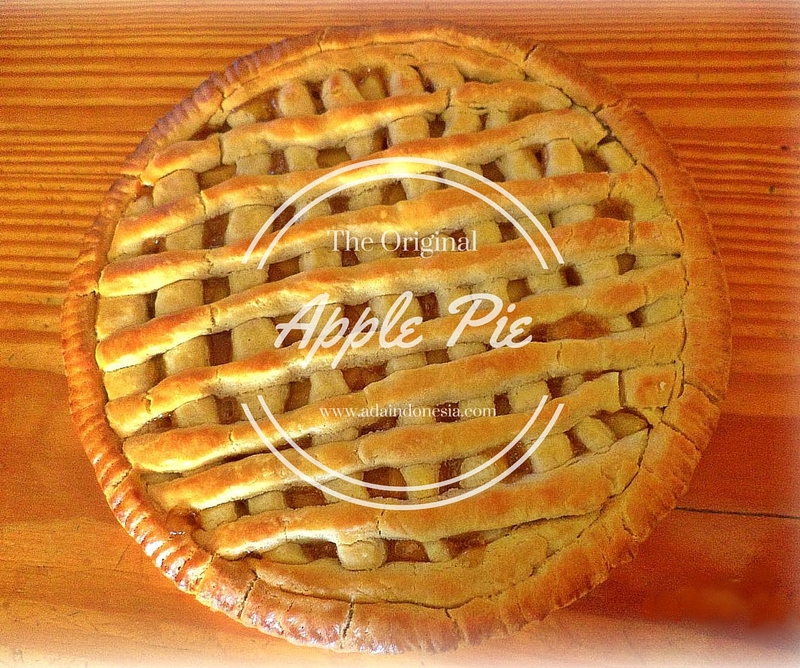 Today we will share a recipe of Apple Pie. In English speaking countries, apple pie is a dessert of enduring popularity, eaten hot or cold, on it’s own or with ice cream, double cream, or custard. To make the dough: combine the flour, salt, and diced cold butter in a mixer or food processor. Beat until you have a sandy mixture. Grate the lemon zest, and squeeze out the juice. Save the juice for make the filling. Now transfer the mixture to a bowl. Add lemon zest, sugar, eggs, and blend the ingredients. When you have a firm dough, wrap in cling film and let it rest in a fridge for about 1 hour. While waiting, start to make the filling. Peel and slice the apples, mix with lemon juice to keep from browning. Heat a pan and add butter. When it’s melted, add apples, sugar, and cinnamon. When the sugar are melted, add cornstarch that already dissolved with water. Simmer for a while until you have a thick sauce. After the resting time, roll out the 3/4 part of the dough and put it on the top of round tart pan that has been buttered and floured, then press it down to line the bottom. Put the filling on it, and cover again with the rest of the dough by stacking like a net. Spread some milk/egg yolk with pastry brush, and cook in the oven at 180 degree for about 30-45 minutes. It’s nice to serve with vanilla ice cream. Use cold butter directly from the fridge, and don’t forget to pre-heat the oven.Thank you for visiting our website. We love to hear from you, so please leave your comment down bellow.